Click here to learn more about Custom URL Mapping. Use URL Mapping to access the underlying field mapping for the integration. If you ever need to map additional fields, or change one of the default mappings, you can do that here. If you change the field mappings you must generate a new URL (click the Generate URL button and click Copy URL to copy to the clipboard) to replace your source integration web hook. The new alert (Source, Source Name, and Source Identifier) does not match an existing open alert in AlertOps, in which case AlertOps will record the new alert in the Inbound Messages table as Mapped Ignored. The new alert contains the Open Value specified in the mapping. An alert is received that matches an existing open alert in AlertOps and the new alert contains the Close Value. AlertOps can combine multiple alerts coming from the same source. Although AlertOps will ignore each duplicate alert, it will log each incoming message in the Inbound Messages table. You can configure AlertOps to Group alerts as a single alert by setting the Source Name and Source Identifier to have the same value, such as a field that has a static value. When using Grouped alerts, the first alert received with Open Status will create a new alert. All other alerts except the close alert will be ignored. The first alert received with the Close Status will close the alert. When the Source Name mapping is static, AlertOps will map based on the URL field, not based on any data in the incoming message. Create Rich messages using runbook links, graph images, linkback to the incident source. Create custom subject lines using a combination of fields. Click here to learn more about Custom URL Mapping Options. You can assign an alert to groups or users simply by sending the group or user name in the incoming JSON. Recipient Group Field and Recipient User Field can be used to pre-assign the Group or User in AlertOps. This is useful for service desk or help desk integrations, such as Remedy, Service Now, or Zendesk. Enter the field name only, brackets are not needed. You can use Topics in AlertOps to assign incoming alerts to Groups. Automatically assign incoming alerts to specific Groups based on a topic. Enter the field name only, brackets are not needed. You can map any fields to an attribute of the Template that is being used. (Note: attribute fields are optional fields in mapping). These fields will only appear when the Template you have specified includes custom attributes. This is useful when you build flows to connect alerts to other systems, such as creating a help desk ticket from a monitoring alert. Enter the field name only, brackets are not needed. You can configure the Subject Text to have a combination of static text and data. The subject is sent out in the email subject. Enter the field name surrounded by brackets. You can configure the Long Message Text to have a combination of static text and data. The Long Message Text and Short Message Text are used in the body of the notification for all communication channels (VOIP, Email, and SMS). Enter the field name surrounded by brackets. You can configure the Short Message Text to have a combination of static text and data. The Long Message Text and Short Message Text are used in the body of the notification for all communication channels (VOIP, Email, and SMS). Enter the field name surrounded by brackets. 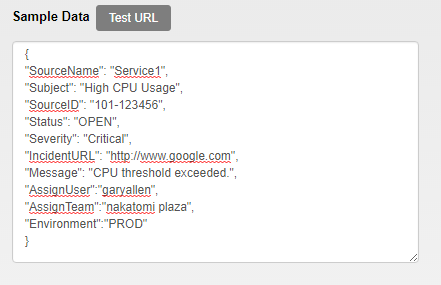 You can include an attachment in the form of a URL in a datafield. You can send one or more URLs in an array structure. Enter the field name surrounded by brackets. Base Path: enter the value for the base path in the incoming URL data. File Name: enter the value for the file name in the incoming URL data. URL: enter the value for the URL in the incoming URL data. AlertOps can send the URL as a clickable link in an email notification, or users can click the link in the web app. Often times, customers want to delay alerts for various reasons. One use case might be to ignore flapping alerts which quickly revert from problem to OK. AlertOps Web API integrations allow you to delay alerts in a variety of ways. Delay until (n) number of alerts have been received within (n) minutes. Delay until (n) number of alerts have been received. Delay alerts for (n) minutes. Delay options until support hours begin. Define the period of time in which users will receive alerts. With the Grouping Options, you may limit the amount of alerts that comes flooding in at one time when it’s from the same source. Select the Group Option to group all alerts received within (n) minutes of opening an alert. The new alerts will merge with the opened alert. Thus, there will not be notifications for the grouped alerts. You can use filters to match alerts to a particular integration.